There are a couple of really good post from Richard Dizerega, Elio Struyf, Mikael Svenson and Waldek Mastykarz. But everyone is talking about dev. stuff or end-user perspective. In this article I will show the idea of Delve, the Graph and how it is working and what can be done from an IT-Pro / Administrator perspective. Delve can also be disabled or enabled per user. To do this the user must go to Office 365 > Delve > Delve settings. 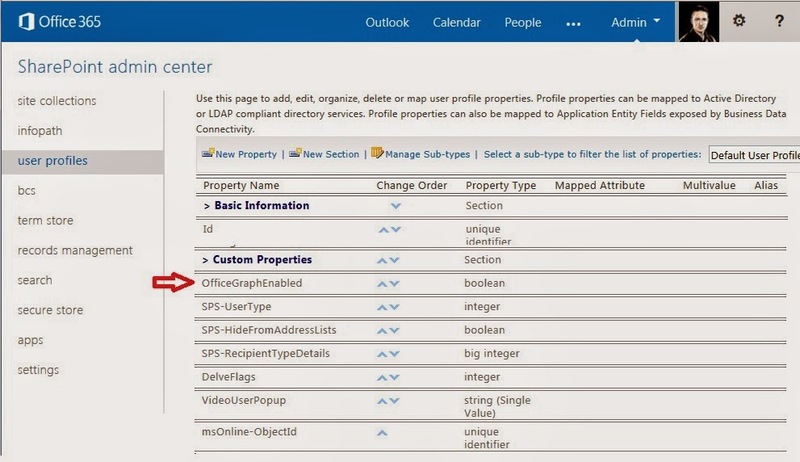 To store this setting we have a new property in User Profile Store: OfficeGraphEnabled. The OfficeGraphEnabled property is only used when a user actively turns off Delve for themselves. The property also results in a crawled and managed property which can be used in Search. So the Administrator can query that property in Search to find out all people within his organization who turned off Delve. This can be useful to get an overview about Delve usage in you organization. We have several other properties in the User Profile service used by Delve. The SPS- properties are there to help the Office graph to determine if user in Exchange Online is a non-person entity such as a meeting room. Users aren’t able to set these properties directly in their SharePoint Online profiles. From IT-Pro & Administrator perspective Delve is a kind of service we have to write code to tweak it. Actually there are no out-of-the-box WebParts etc. we can use to work with Delve. But we have a bunch of preconfigured code snippets, examples, SharePoint Apps and tools which can be very useful also for Admins and IT-Pros. Elio Struyf did a great job with his code sample to use SharePoint search center to visualize Graph Queries. But we can see all public objects for a given Actor ID to verify our security concept works well. This app showes the query which is used to get a result. 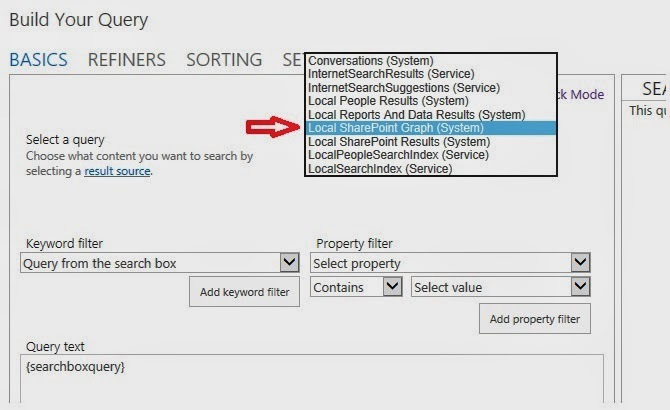 This query can then be used and modified in the SharePoint 2013 Search Query Tool. I have a codeplex project for an experimental SharePoint 2013 Search API Results Webpart. This WebPart is visualizing the JSON result comming from search service as a simple list. Modifying the query in the script you can use this script to show Graph results where ever you have to. This can be useful to show Graph results as part of you intranet landing page which is maybe not SharePoint etc. In several project I had the request to deactivate one or all of the following features. Poorly there is no consistent way to do it. To deactivate that feature we can use the SPList.ExcludeFromOfflineClient property. With this PowerShell Script we can set the value to 1 which deactivates the Synch function everywhere. If we can start with a fresh system we can remove the permissions to create MySites. If already MySites are created we first must delete them. Only the MySites, not the MySite host! Do not give the user the option to set up MySites will also remove the Newsfeed and the OneDrive link in the SharePoint top link bar. The first version of Delve formerly known as “Project Olso & Office Graph” is now available. Delve (Codename Oslo) is the first experience to use the power of the Office Graph. Delve is a new way to search and discover content across Office 365 based on personalized insights. Delve will be available as a Windows 8 app, on mobile devices, and integrated in the Office 365 web experience. 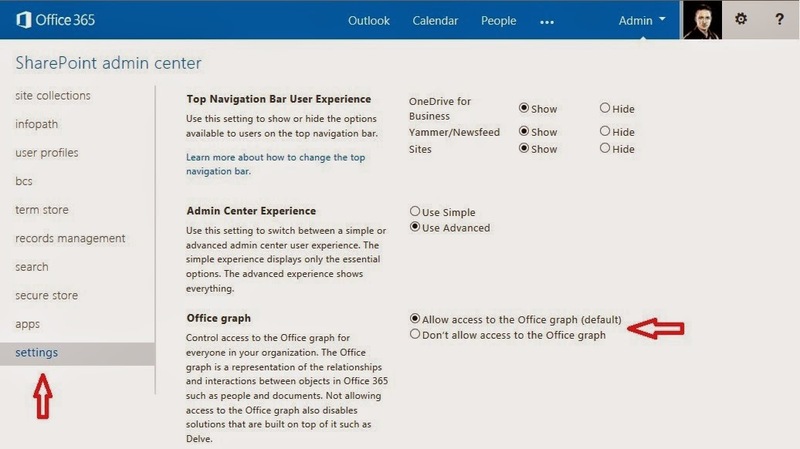 Office Graph is an underlying technology and a suite-wide intelligence fabric that will help you discover content and make new connections. The Office Graph analyzes signals and applies machine learning. Personalized insights are built up for each user, based on their behavior, their relationships to content, topics and one another. Content and signals are captured from Exchange Online, SharePoint Online, and Yammer. The Delve feature is located in the Office Bar at the top of the O365 site. 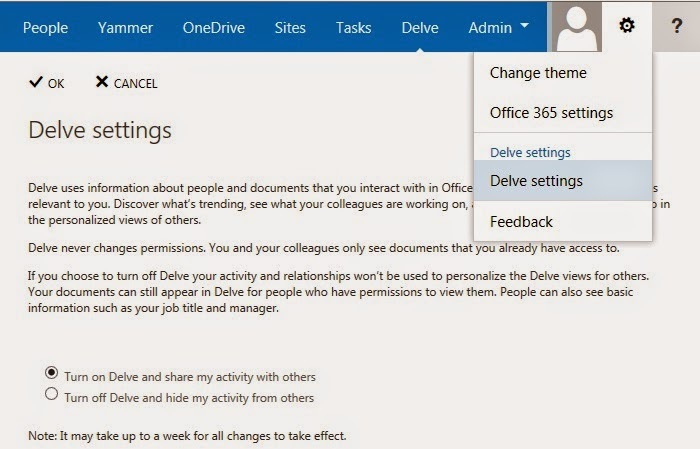 Delve is only available for O365. 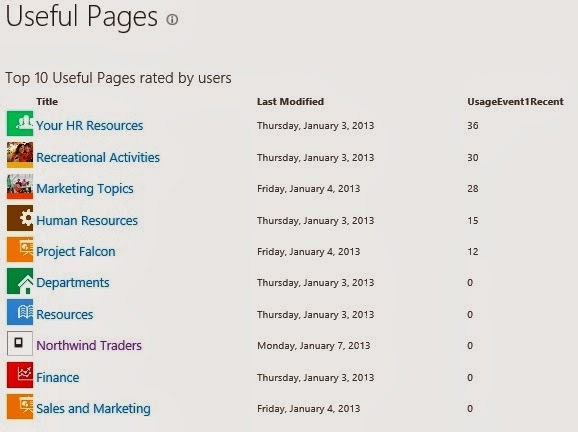 Delve shows content from SharePoint team sites and OneDrive for business content. In the future, we will see more content sources to push content to the Office Graph, such as email attachments, meetings, group content, video portal content, Yammer signals/shares etc. We will also see an API for Delve in the future. The API will probably be a REST-based API supporting CRUD operations. This result source is not shown under SharePoint online administration or in the site settings menu. It’s only visible in the Query Builder. The Office Graph gets its own index. We can assume that this new result source is mapped to the new Graph Index. The new result source is not showing any results using it in a search result web part. Is Delve only another content aggregation? So is Delve only an aggregated view of all this? No it is not! Delve is based on the Office Graph, which is a kind of machine learning to map the relationships between people, content, and activity that occurs across Office 365. To give you an idea how this works, let’s have a look at the following example. I use this engine to get the following report. 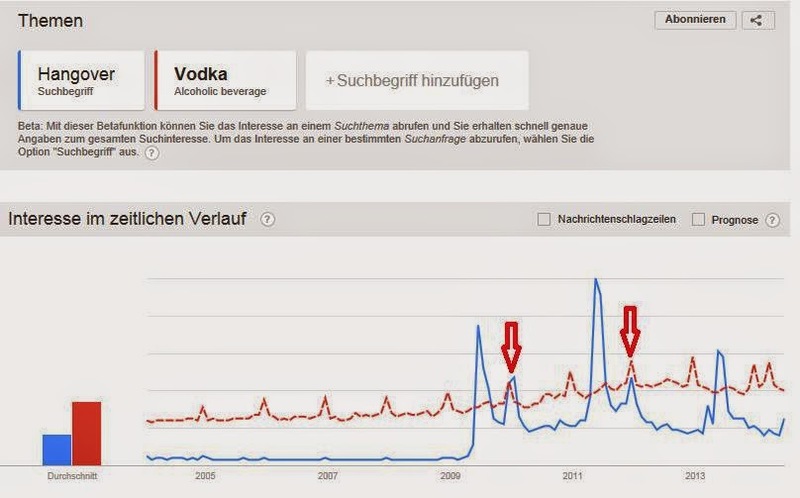 There is a correlation between these search terms and the date New Year’s Eve. In Delve it would be two people who are working both on the same document and because of this correlation, the system (Delve) is showing that document in the context of “trends around me.” The backend logig, algorithems and ranking models of Delve respect those correlations based on so called “signals” A signal for example is generated whene a user clicks on a document etc. SharePoint Analytics works in a similar way. In SharePoint Analytics we talk about “events” which is the same like a “signal” in Delve / Office Graph. Both techniques are collecting, aggregation and analyzing what user are doing and is generating correlations between content and content and users. Both solution Delve / Office Graph and SharePoint Analytics doing similar analytics but Delve is going a step forward and will soon also integrate Yammer and other components from O365. To complete this, let’s have a look at how the SharePoint features like Items “Related to Current User” or “Suggested documents to follow” works. So the following features are based on SharePoint Search and SharePoint Analytics. They are part of SharePoint on-prem and can be used without Office Graph and Delve. Delve is based on search driven solution and the Office Graph, but this is not SharePoint Search or SharePoint Analytics. Delve has its own index and its own backend system as part of Office 365. Delve is not available as part of SharePoint search-driven solutions or WebParts. Also the Office Graph can not used as a result source in SharePoint Search Querys or Search WebParts. It’s a separate and independent solution. When you add Delve on top of the traditional search results, this all can be a little bit confusing for end users and decision makers; a company needs a strategy for all of this. I think that Delve is the future of all these ideas and techniques. Delve will get an addition push with the upcoming Phone and Windows Apps, which allows us to get access to all this using mobile devices and without using the web interface of Office 365. Again, you need more description here. How is this related to the bullet list above? 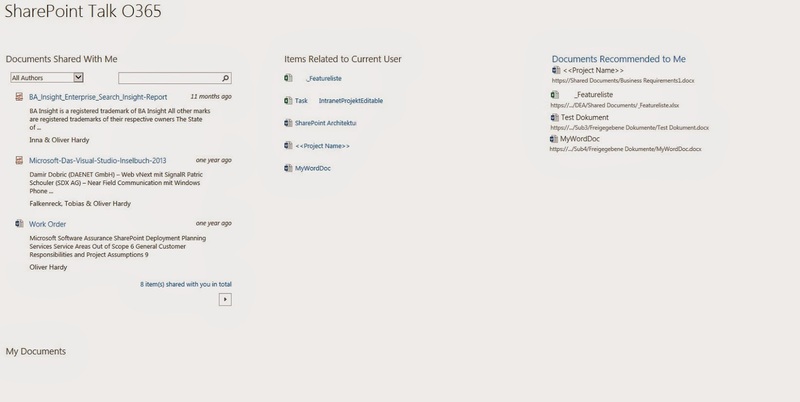 Belonging to comment NB5: Delve is new and not based on SharePoint Search or SharePoint Analytics feature. Delve had its own index and its own backend system the Office Graph. All this is not available in std. 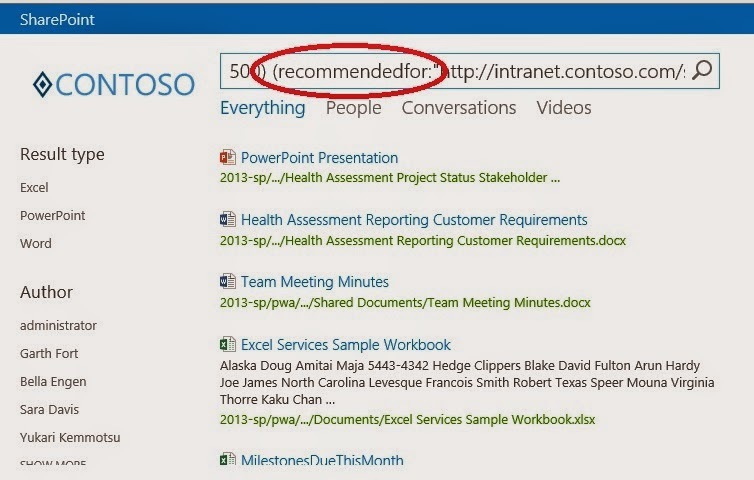 Search Driven Solutions build with regular SharePoint Features like in the “Search Based” bullet list. CONNECT with world-renowned subject matter experts and peers in community-driven forums. Take advantage of experts' regular office hours and ask the questions. Gain invaluable insight through lively discussion of issues that community members are facing. SHARE how you've solved a problem, created a service or product, or developed expertise. IT Unity's global audience and network of industry relationships will enhance your visibility and the impact you can make on the broader community. DISCOVER how SharePoint, Office 365, and other technologies can drive innovation and business value. Find best practices, guidance, lessons learned and other solutions from experts and organizations that have tackled the challenges you face. DEVELOP your knowledge, your skills, your reputation, and your professional network. IT Unity revolutionizes the way technical content is created, customized, and consumed, and the way individuals and organizations connect with the guidance, expertise, and solutions they need to achieve their business objectives. Today, as we launch, you'll find in-depth content from trusted technical and thought leaders, product and service providers, and exciting new voices in the tech community. You'll discover a new resource for asking questions, and getting answers from experts and peers. You'll can create and join professional networks and communities of practice. And you'll learn about how our contributors have solved real-world problems, by using out-of-box technologies, customizations and extensions, and third-party tools. We've got big plans for IT Unity. We couldn't be more excited to share this news with you. Thank you for becoming a part of this CommUNITY! Drying to rename public facing website in O365 SharePoint Online is greyed out because of there is no more storage available. So far, so good. Now let’s see how this can be done because of some code snippets in the original article won’t work very well. In the following example we will create a custom event called “UseFulPage” and add a button to SharePoint to fire that event. The new custom event had several properties and also 2 managed properties (UsageEvent1LifeTime & UsageEvent1Recent) which can directly be used in Search or Search Driven WebParts after the next analytics processing run. Replace %EventGUID% with the GUID of your custom event. Use a ScriptEditor WebPart to host the script in your SharePoint site.